Lymph node - Necrosis in a treated male Harlan Sprague-Dawley rat from a subchronic study. A central focus of necrotic cellular debris (arrow) is evident. 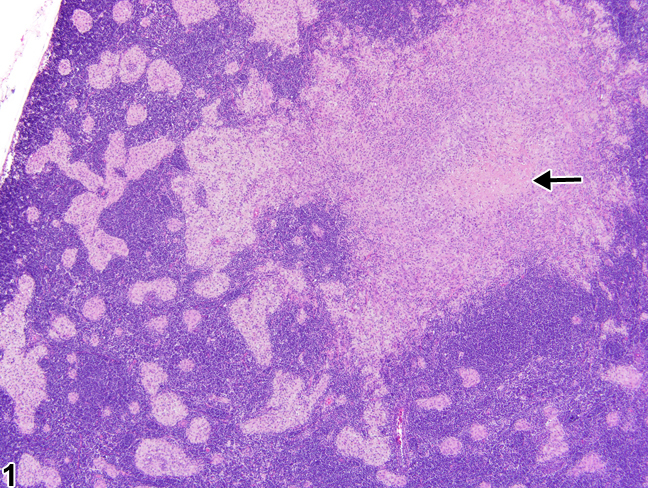 Lymph node - Necrosis in a treated male Harlan Sprague-Dawley rat from a subchronic study (higher magnification of Figure 1). 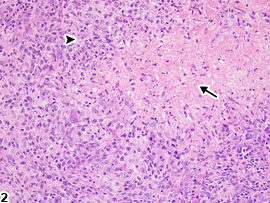 The necrosis (arrow) is surrounded by a mixed inflammatory infiltrate with fibrous connective tissue (arrowhead). Necrosis of the lymph nodes is an uncommon lesion in rodents; however, it may be induced by obstruction of blood flow (infarction), neoplasia, an infectious agent (e.g., fungi, bacteria), or foreign body (e.g., test article). This lesion is characterized by cellular swelling with chromatin clumping, karyorrhexis, or karyolysis, leading to dissolution of nuclei, cell lysis, and accumulation of abundant granular eosinophilic material ( Figure 1 and Figure 2 , arrows). 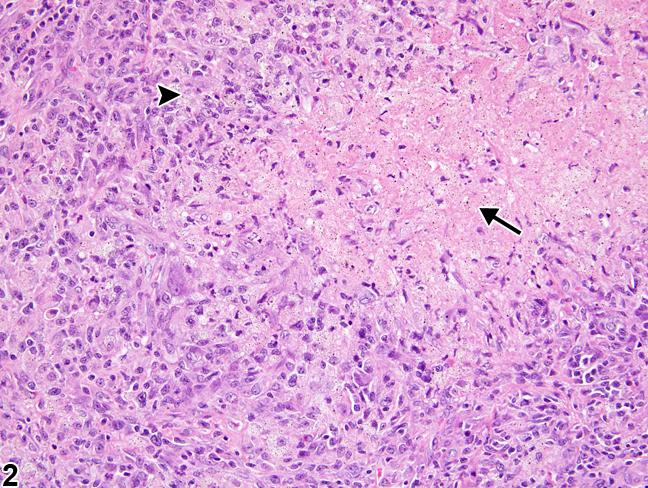 Lymph node necrosis is generally accompanied by inflammation ( Figure 2 , arrowhead) and can also be accompanied by fibrosis, hemorrhage, and/or mineralization, depending on severity and chronicity. Necrosis should be differentiated from lymphocyte apoptosis, which is characterized by cell shrinkage, nuclear pyknosis, and fragmentation of lymphocytes into membrane-bound (apoptotic) bodies that are subsequently phagocytized by macrophages (tingible-body macrophages). Necrosis of the lymph node should be diagnosed and assigned a severity grade. If lymph node necrosis is present secondary to another lesion (e.g., neoplasia, inflammation), it should not be diagnosed unless warranted by severity, but should be described in the pathology narrative. National Toxicology Program. 2010. 39-Week Study (No. C20213) of Abrasive Blasting Agents (CAS No. Blastingsand) in Harlan Sprague Dawley Rats (Inhalation Studies). NTP, Research Triangle Park, NC.